I’ve been playing with my Whisper Node this week and it seems to be working fine for raw LoRa (using RadioHead RF95 library), but when using the LMIC it sends only the first message to the LoRaWAN Gateway and kind of hangs after that. Just an update on this. 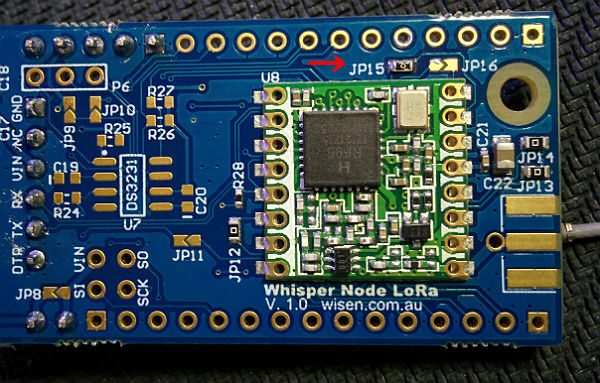 I’ve manage to solder the jumper (JP15) and it worked! I need to confess was my first SMD soldering work and it wasn’t difficult at all. Good day would you be able to share your entire sketch for the Whisper Node? Thank you @MoebiusL for sharing the required hardware change. This was my first SMD soldering too, but it was not too hard to do. As illustrated in your picture I took one of the Zero-ohm-links supplied with the nodes (a white strip of about 5) and soldered it over the two JP15 pads, functionally similar to a through-hole pin jumper. I added a bit of flux on the two adjoining pads, heated them up with the soldering iron and lightly touched each of them with 0.3 mm flux cored solder, still applying heat. I carefully placed the small jumper over both of them using a pair of pincers and applied heat to solder it in place. As I did not have a suitable SMD tip for my iron, heat spread over both pads. Actually this helped in this case as the jumper settled quite nice. Finally I measured resistance over both adjoining pads to verify they were connected. I then changed the pin mapping for lmic. My Whisper Nodes have been posting data to TTN for a few days now, and it seems to have resolved the issue in a reliable manner. I assume this was by design and part of the reason why the jumpers are supplied. So far I love these nodes and I think they are perfect for low energy applications. I have one related question - if I want to change the u.FL connector for a SMA edge connector, do I have to desolder the u.FL connector? I assume I do, but I would like confirmation from someone who knows @wisen . Hi @eivholt, I’ve soldered the SMA connector on the board without removing the u.FL. It sits perfectly there… I just had to put my soldering iron to high temperature as the SMA seems o absorb all heat making very difficult for the solder to melt nicely. Btw, I’m also having fun with my nodes, but I keep moving them from one project to another… might need a few more. Cool, I’ll try leaving it on. I assume the u.FL doesn’t form a closed circuit as long as no antenna is connected to it. I can imagine the SMA absorbs a lot of heat. I don’t have a broad tip for my soldering iron so thanks for the heads up! I am going to add a coin cell battery holder on some of my Whisper Nodes and see how it works out. I assume the u.FL doesn’t form a closed circuit as long as no antenna is connected to it. I would leave it in place. Unless you have a lot of de-soldering experience, there is a significant risk of damaging the board in the removal attempt. Just to confirm that it’s not necessary to desolder the u.FL connector. The SMA Edge will fit without creating any short. In case anyone needs to desolder an u.FL or SMA, the best way is by using hot-air. Alternatively carefully destroying the component with a wire cutter and desoldering individual “legs” is the safest approach. Thanks for the confirmation. I have done this successfully on two nodes so far. Is it possible to give any general comparison on using the supplied pcb-antenna as apposed to the SMA whip antenna with respect to energy consumption. This is probably a many faceted problem to answer but taken the scenario: I have my lora gateway (TTN GW) in my house and I want nodes no further than 15 meters from this point. I want my nodes to run on 3V coin cells. Are these two antennas even anything I should consider when optimizing energy consumption? I take it a “larger” antenna requires more energy to resonate, but at what order of magnitude? Downlink is not in use in this example. Snowy and wet scandinavian weather is a consideration as the antenna will be exposed. I would appreciate any insight that could help me make the nodes last as long as possible. I am awaiting an oscilloscope and will perform some tests with the different antenna configurations but I suspect someone with deeper knowledge has already done this. I take it a “larger” antenna requires more energy to resonate, but at what order of magnitude? Downlink is not in use in this example. Snowy and wet scandinavian weather is a consideration as the antenna will be exposed. I would appreciate any insight that could help me make the nodes last as long as possible. In general, the larger the antenna, the better it radiates, and thus you require less transmit power (and less battery current) to cover a given distance. Those small ceramic antennas are not very efficient, compared say to a simple bit of wire, although the wire would be bigger of course. Thanks for your posts @MoebiusL, @eivholt. Great to hear it works, I’m interested in this configuration too. Also, I’m interested in such a setup: lmic+whispernode+lowpowerlib on ttn. Anybody here who has acompished this (and likes to share)? Thanks! 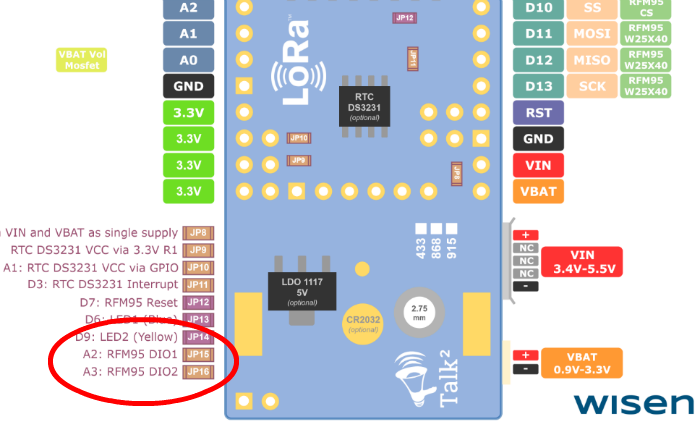 Im i got a lora whisper node but i cant seem to find a example of how to send and receive information to the lora nertwork. Its supposed to be powered by an ATMEGA328P and is ‘Arduino compatible’ so as long as you adjust the pin numbers to match any code for the Arduino UNO ought to work. 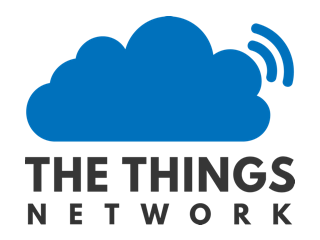 A Google search on ‘Arduino TTN node’ ought to find something. I searched and found some examples. I manage to make one compile and run in the whisper node but i didn’t got anything on the TTN console. Are they ok? In the beginning of the post you mention you need to solder one of the jumpers, do i need to do it? I just soldered the header pins. I didnt solder any jumper. Shouln’t ir work withaut the jumper? The thing is i still didn’t get anything in in TTN console. Any ideas of the problem?